President Biya’s time as head of state is now short. To be sure, the Cameroonian dictator is a dead man walking according to recent statements made by the US ambassador to Yaoundé, Peter Barlerin, a view shared by many in the ruling CPDM Central Committee and predicted by senior French Cameroun political experts. The 85 year old leader has survived almost 2 years of Southern Cameroons demonstrations and growing violence, and if not pushed by the US and the French including some outside actors he may yet cling to power in the upcoming so-called presidential elections. It’s easy to see why many Cameroonians think Ambassador Peter Barlerin’s pronouncement indicates that Biya’s time might be up. Despite the killings of over 1,000 Southern Cameroons protesters and the arrests of thousands more, Southern Cameroonians have bravely defied the Yaoundé regime, which now seems unable to bully them into submission. As the Southern Cameroons resistance has stood strong, Biya’s international support has plummeted. But for the French, the CPDM regime would have been a thing of the past. Although the world is actually not doing anything as Biya regime forces continue to gun down innocent Southern Cameroonian civilians, Ambassador Peter Barlerin’s recent comments is a clear indication that the time has come for Mr. Paul Biya to step aside. 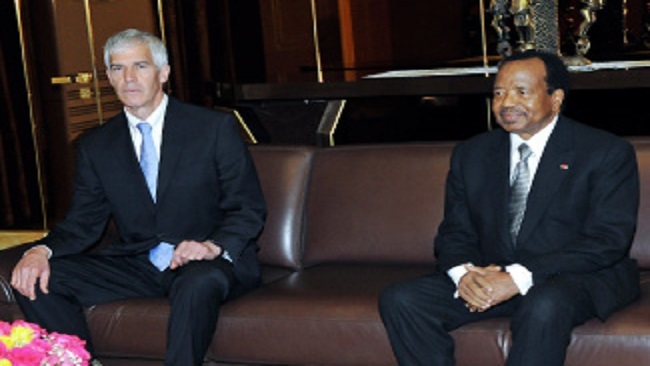 The United States chief diplomat in Cameroon has repeatedly called for genuine and inclusive dialogue and has offered himself to try to broker a deal for Biya to speak with the Ambazonian leadership. Biya has constantly scorns these calls and consequently his cash-strapped regime will soon find it harder to pay its tribal security services. Rather than kill innocent Southern Cameroonians, several soldiers have defected from the Cameroon army. Cameroon Concord News Group gathered that the pace is escalating at catastrophic rapidity, and many more French Cameroun army soldiers are now confined to barracks in Buea and Douala because the Biya regime doesn’t trust them. The Ambazonia Self-Defense Council Restoration Forces is apparently controlled largely by defectors and it is getting stronger and is now operating freely in the various Southern Cameroons counties. The US ambassador’s killer punch has hit the Yaoundé regime hard, but Biya has neither bent nor broken — and he still has a number of serious assets including the French government, the CEMAC countries and mighty Nigeria on his side of the equation. Looking at the loyalty of the military and security services, the Southern Cameroons Self-Defense Council Restoration Forces is getting stronger, but it lacks long or short range missiles and other heavy weapons. So it finds it difficult to hold territories. The Francophone regime is still stronger than the Southern Cameroons Interim Government. The presidential guard and a huge regiment of ground forces particularly those from the Far North region recruited by the ailing Vice Prime Minister Amadou Ali during his time at the defense ministry are still loyal, and Biya’s blood relations and kinsmen hold key positions in the Cameroon government. The overwhelming majority of the officers are Francophone Cameroonians and nearly every family from Biya’s ruling tribes the Beti-Ewondo have at least one member in the security service. The Far North region again is a strong base for the regime: It is well armed, mobilized, and fearful that the fall of Biya might invoke a nasty past that led to the killing of hundreds of soldiers from the North region headquartered in Garoua immediately after the April 6th coup in 1984. The regime has created militias along with military forces, using them as thugs and snipers against Southern Cameroonian citizens. As the violence escalates, sectarian killing increases too. Deep within the Biya regime the military hierarchy and Biya acolytes eat first; the funny SDF opposition eats last. The French government via its multinationals is giving the Biya regime an economic lifeline and enough bullets to keep shooting down Southern Cameroonians and is blocking international efforts by the Ambazonian Interim Government to isolate the regime. The biggest hope for Biya now is the disorganization created by some of the Southern Cameroons resistance figures group under an obscure organization known as the Ambazonia Recognition and Collaborative Council. There is no charismatic leader among the trio but their main goal is to attack the legitimate Interim Government of the people of Southern Cameroons. Not surprisingly, there are sharp divisions between those on Ground Zero bearing the brunt of the Biya regime’s brutality and those who live safely outside Southern Cameroons and represent the struggle abroad. So far at least, the Interim Government enjoys some sympathy from the international community but no active support from major powers such as the US and Britain. To be accurate, the French Cameroun dictator is not strong enough to subdue the Ambazonian resistance and quest for an independent state, but Ambazonians are not just strong enough to defend the Southern Cameroons territory — a scenario for continued fighting and killing. If Southern Cameroonians are to pull out of the Cameroon federation, they need a push from the international community. Particularly important is the effort to build up a Southern Cameroons army: uniting it and training its officers so they can be more effective in battle. At the same time, the Interim Government must avoid the distractions coming from the so-called Ambazonia Recognition and Collaborative Council at all costs. The IG should continue pushing for a UN and EU intervention to be on the table to signal that the international community is aware of the genocide going on in Southern Cameroons. U.S. and European Union rhetoric should warn that military option will grow more likely if Biya doesn’t step down. The US ambassador should continue ratcheting up the pressure as this will help convince CPDM loyalists that the regime cannot weather the storm and that they need to abandon ship now — rather than do so when bombs starts dropping in Yaoundé. Only this forceful effort started by Ambassador Peter Barlerin will end the rule of the man who has been walking his people into a nightmare. Any less will see the bloodshed continue indefinitely, possibly sucking in neighboring states like Nigeria.